Hydrangea paniculata 'Levana' is an easy-to-grow, vigorous, strong stemmed, upright, deciduous shrub with dark-green foliage and in late summer and early autumn, conical panicles of white flowers, florets on long peduncles. 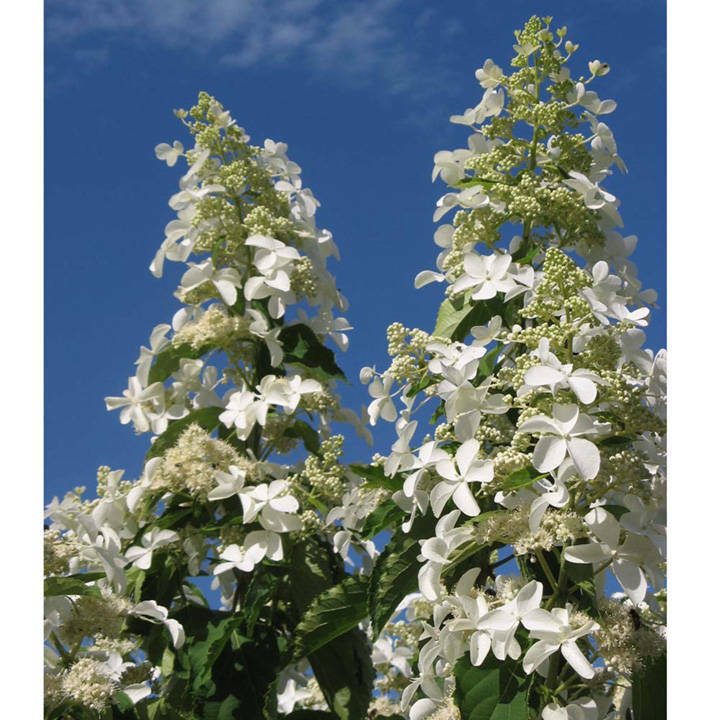 These blooms consist of small, lightly fragrant, fertile flowers which are attractive to bees and butterflies; and larger pure white sterile flowers. It requires sun and moist soil. Prune hard and feed in spring to encourage fresh growth. Flowers July-September. Height 200-250cm. Supplied in a 7.5-10 litre pot. Hydrangea paniculata 'Levana' is an easy-to-grow, vigorous, strong stemmed, upright, deciduous shrub with dark-green foliage and in late summer and early autumn, conical panicles of white flowers, florets on long peduncles. 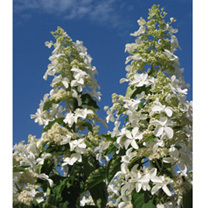 These blooms consist of small, lightly fragrant, fertile flowers which are attractive to bees and butterflies; and larger pure white sterile flowers. It requires sun and moist soil. Prune hard and feed in spring to encourage fresh growth. Flowers July-September. Height 200-250cm. Supplied in a 3 litre pot or 7.5-10 litre pot. Ideal for beds and borders, patio pots and contaniers. Prefers full sun or partial shade.